What is a New York Eviction Notice? New York Eviction Notice: What Is It? A New York eviction notice is an important and necessary part of the eviction process. Depending on why the eviction notice is being issued, an eviction notice may be given in writing or verbally. As you can probably imagine, it’s much easier for a landlord to prove that an eviction notice was properly served if it is in writing. An eviction notice is also known as a notice to quit. All eviction notices must comply with federal housing laws, New York’s landlord-tenant laws, and any ordinances or statutes set by a county or a city. What Are the Components of a New York Eviction Notice? The name of the tenant or tenants who are obligated to the lease. 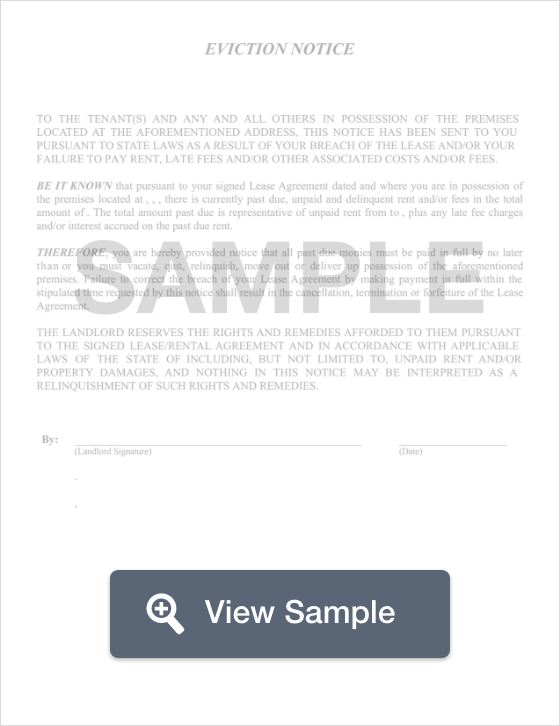 One of the best ways to do this is to pull a copy of the signed lease and use the name(s) of the tenant(s). The date that the notice to quit is being created. This is important because the date by which the tenant must correct the violation or leave the property is based on this date. Notices aren’t arbitrarily written and dated. The full address of the rental property. This includes any building number, unit number, city, and the county where the property is located. How many days the tenant has to fix the violation or leave the property. The deadline by which the tenant must take action. A Certificate of Service that lists the date, the name of the person on whom it was served, how it was served, and the signature of the person who completed service. Legal service methods can depend on the county where the rental property is located. As mentioned earlier, while a landlord may serve a verbal notice to quit in some instances, that can make the matter hard to prove if the landlord sues the tenant. So, a written eviction notice is often easier to serve and prove service in court if it is necessary. The most common service methods include personally serving the tenant by way of a professional process server or another individual who is at least 18 years old. Landlords may not personally serve tenants. The notice may also be served by certified mail. If the landlord chooses to use certified mail, they must also place a copy of the notice on the premises. Generally, the front door to the rental unit is the best place to do this. A 3-day notice to quit for non-payment of rent is also known as a notice to pay or quit. It may be given verbally or in writing. If it is done in writing, it is much easier for the landlord to prove in court provided that the certificate of service is properly completed by the process server. This notice informs the tenant that they are late on their rent and have three days to pay or leave the property. It should list the total amount that was past due, the accepted payment methods (such as a money order), and where it may be paid. This notice must comply with § 711.2 and § 751.1. A 10-day notice to quit for non-compliance must be given in writing. It is also known as a notice to cure or a notice to comply or quit. This notice explains to the tenant that they violated the lease and have ten days from the date of the notice to correct the problem or leave the property. The landlord should clearly explain the violation of the lease in this notice and the deadline to correct the property or leave. This notice must follow with § 753.4. A 30-day notice of termination for a month-to-month lease can be used by the tenant or landlord. It doesn’t necessarily get created because the tenant did something that they must correct or leave the property. Instead, it’s just a way that either party can inform the recipient that they do not plan to renew the month-to-month tenancy. It must give the 30-day deadline by which the property must be vacant and returned to the care of the landlord (§ 232-a, 232-b). What Are the Legal Considerations of a New York Eviction Notice? A notice to quit for non-payment of rent may be provided either verbally or in writing. As mentioned, though, it is much easier to prove that the tenant was properly served if the notice was in writing. All eviction notices must comply with federal, state, and city landlord-tenant laws and housing laws. Tenants must be served with an eviction notice before the landlord may begin a lawsuit against them. Until the landlord receives a court order, they may not remove the belongings of the former tenant, replace the locks, or shut off the utilities. Doing so before getting the court order is illegal. Landlords who use self-help eviction methods without the permission of the court may give the tenant grounds to sue them for financial compensation and continued possession of the rental property. Additionally, landlords may not evict tenants because of the tenant’s race, the color of their skin, their religions beliefs, their country of origin, their gender, a disability, or because of how the family is structured (known as family status, this includes pregnancy and the presence of one or more minor children whether belonging to the tenant by birth or by adoption). These reasons are discriminatory at both the federal and the state level. Landlords may not evict tenants because the tenant reports the property or the landlord for code violations or because the property is uninhabitable. Landlords have a legal obligation to maintain the property in a way that is safe and habitable. Tenants in New York have rights. These rights exist at the federal level, the state level, and sometimes even at the city level. To learn more about your rights as a tenant, you can start by visiting the Tenants’ Rights Guide provided by the New York State Attorney General. If you receive a written eviction notice, read it carefully so that you understand why it was issued, what you need to do, and the deadline by which it must be done. An eviction notice for non-payment of rent may be given verbally or in writing. As mentioned under Legal Considerations, not every eviction is legal. You cannot be evicted for discriminatory reasons, because you reported the property or the landlord to the housing authority for code problems, and the landlord may not use “self-help” methods (like changing the locks and disposing of your property) unless they get a court order. If an illegal eviction takes place, you may have the legal right to sue the landlord. To know whether you have a valid claim (or to even get help if you have questions about evictions in New York), you can make an appointment to talk with a landlord-tenant lawyer. They can explain your rights to you, answer your questions, and let you know whether you have a claim you can file against the landlord. You can also contact a law school near you and ask if they have a legal clinic. Legal clinics provide low-cost or free legal help for a variety of legal matters. You can also contact a New York legal aid office to find out if you qualify for their help. Even if you don’t, they have a plethora of resources that you may be able to use to get educated and help yourself. Landlords are required to follow federal housing laws, New York’s landlord-tenant laws, and any city ordinances set where the property is located. While landlords may issue a verbal eviction notice if the rent isn’t paid, it can be hard to prove if the landlord sues the tenant. A landlord must serve the tenant with an eviction notice before they can sue the tenant. While landlords do have rights or obligations, they cannot take certain actions (like turning off the utilities to the property) without first getting an order from the court. Self-help methods, evicting for discrimination, and retaliatory eviction are all illegal. If a landlord is involved in an illegal eviction, they may be sued by the tenant for financial compensation. It’s important that landlords understand their rights, their obligations, and how the laws affect what they can and can’t do. If you’re a landlord, consider booking a consultation with a landlord-tenant lawyer in the city or town where the rental property is located. Consider it an investment into your future as a landlord.